It doesn't matter if it's in Columbus in the International League or El Paso in the Pacific Coast League, Francisco Mejia rakes. The Padres' third-ranked prospect went 3-for-4 with a double in his first multi-hit game for his new team as Triple-A El Paso edged Oklahoma City, 2-1, on Saturday at Chickasaw Bricktown Ballpark. "I haven't seen him much," El Paso hitting coach Morgan Burkhart said. "But he looks good from the limited time I've seen him. "His hands, he gets those hands through with extreme authority. You're working with guys in the cage and there a few guys that have that sound [when they hit]. And when he gets in there, you can tell the ball is coming off the bat well. His hands get through the zone well and his body stays in a good position, so to create that much violence is key." 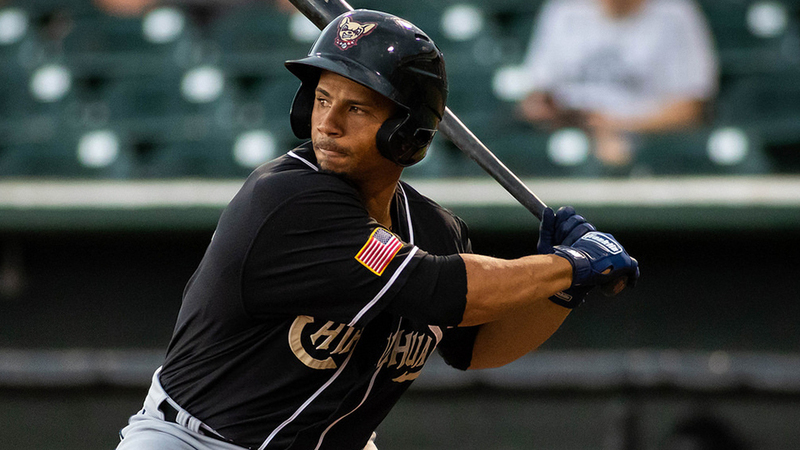 Mejia, who was acquired from the Indians for Major League relievers Brad Hand and Adam Cimber on July 19, is 5-for-12 with two RBIs since joining the Chihuahuas and is 4-for-5 in his last two games after recording a pinch-hit single in Friday's 8-2 win. MLB.com's No. 21 overall prospect brought a .278/.327/.422 Triple-A slash line into Saturday's contest. He's also played 12 games in the big leagues with the Indians over the past two seasons, going 2-for-15. "He's fitting in great," Burkhart said. "It's nice to have a guy come in like that, obviously, for the Padres organization. I'm sure they're excited about him and for us to get him and stick him in there, I think it's big. It's nice to have a bat like that in the middle of the lineup and we'll see how it goes from here. "Hopefully, he produces and I'd like to see him do well for awhile, but you'd also like to see him in the big leagues. So we'll see how that goes." Mejia drove a single up the middle off starter Manny Banuelos in the first inning and poked another single to left field against the left-hander in the sixth. He roped a double to left off righty Brian Schlitter leading off the eighth in a 1-1 game and took third on Allen Craig's groundout but was stranded after Diego Goris struck out and Auston Bousfield bounced to second. Dusty Coleman broke the deadlock an inning later with his 11th homer. Forrestt Allday singled home Bousfield with his second hit of the night. Banuelos gave up five hits and a walk over six scoreless frames, striking out five.